Naperville is a 5th largest city in Illinois and it was recently named the fastest growing city in the Midwest. Number of residents has really increased there since we started business when Naperville was rapidly building up at the turn of a century. Lots of renown companies have set their offices there and many successful businesses started. From basic necessities to luxury services including limousine services, Naperville offers everything one may be looking for. And our company is glad to provide luxury car service to its residents and guests. 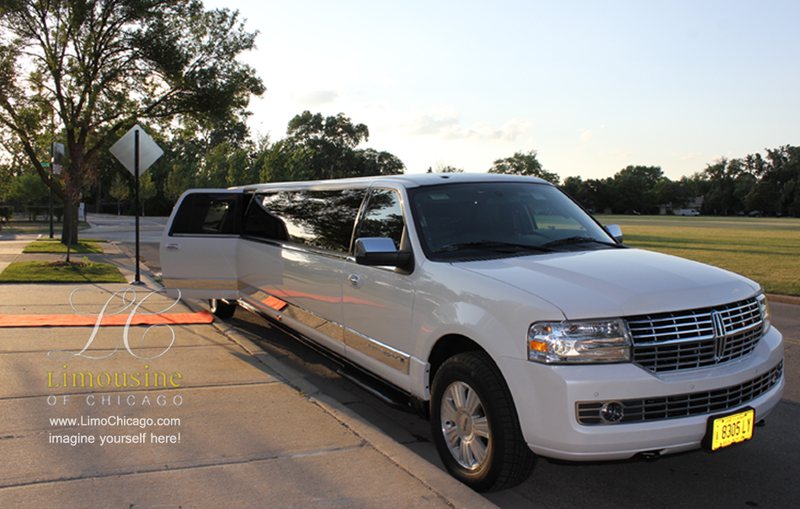 With our wide selection of limousines, we cater to almost any taste. Featuring 14 passenger white SUV Lincoln Navigator, as our most popular option for weddings and bachelor parties, we recommend it as the best value as the number of people this beautiful vehicle can fit in is the most reasonable and the amenities it offers are all right there. It would take a bride and a groom, 10 of their best people and photographer with a cameraman all at once. It is an ideal combination for value, comfort and convenience with price. Meson Sabika, NIU Naperville even Bar Louie can serve as your wedding reception venues. Ceremonies and wedding picture taking can happen at Naperville Riverwalk, Centennial Beach, with adjacent Centennial Park, Commissioners Park, Community Garden Plots and others. But in order to get around you would need a great and reliable transportation. And yes, we can absolutely help! From 3 passenger Town Car and Mercedes Benz s550 to 30 passenger Party bus, we can be your single point of reference for your limo needs at your wedding day. With over 13 years of service, we take pride in our meticulous service and attention to details. Customer satisfaction is in a center of our attention during every single trip or event. The value you are going to get for your money should command your utmost attention when making a choice of vehicles for your wedding in Naperville or anywhere in Chicagoland area. If you have a plan for what will be happening, lay it out, and we will listen. It is not a single vehicle that you may order. You might want to have groom pick up friends and then make a great appearance at his bride’s door. But we can arrange for picking up parents or other valued guests from across the town or another city “far-far-away” with our other limousines. In case of multiple vehicles, the best way to arrange for it is within a single company to avoid confusions and delays. Our drivers will show up as clockwork at your doorstep no matter size of the wedding. And you will have convenience of single point of reference. closer to the wedding, you will realize that having to remember extra phone numbers and who does what is a huge hassle and might really end up pitiful. So let us help you handle your most precious day’s transportation and car service needs! Want to know more? Call us or drop a line at our contact form.Or just click CHAT button above to inquire!